A Map of North America by J. Palairet, with considerable alterations & improvements from D'Anville, Mitchell & Bellin by L. Delarochette. 1765. All southern colonies stretch west to the Mississippi. Northeast portioned off. "First meridian through Ferro Island." Northwest is unknown. Gulf of Mexico and the Caribbean are well-known. Azores show at far right. Text gives fishing rights of the French people off the northeast coast. 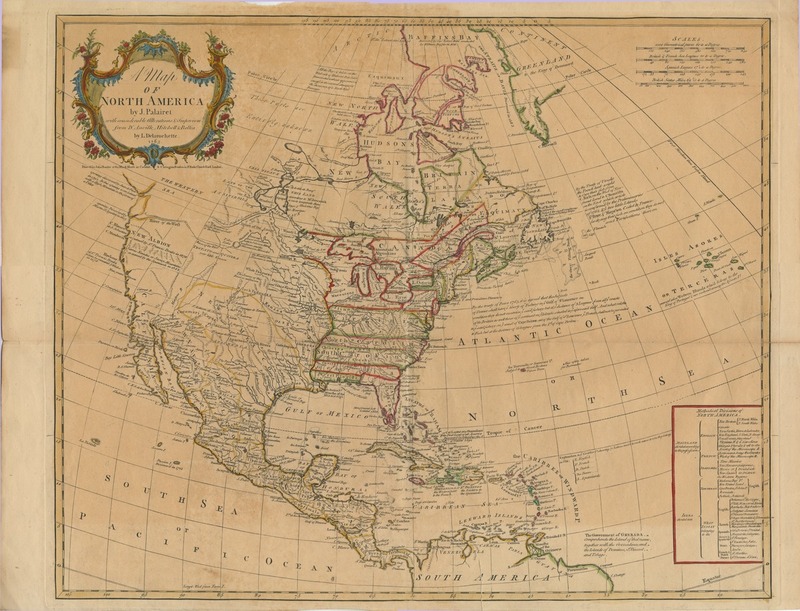 A Map of North America by J. Palairet, with considerable alterations &amp; improvements from D'Anville, Mitchell &amp; Bellin by L. Delarochette. 1765. A Map of North America by J. Palairet, with considerable alterations &amp; improvements from D'Anville, Mitchell &amp; Bellin by L. Delarochette. 1765. Printed for John Bowles . . . &amp; Carrington Bowles in St. Paul's Churchyard, London., 1765. George T. Abell Map Collection, MC 67. Archives and Special Collections, Mary Couts Burnett Library. https://archives.tcu.edu/repositories/2/archival_objects/14922 Accessed April 23, 2019.